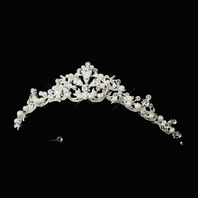 Jemma-Romantic ivory crystal bridal tiara - SALE!! 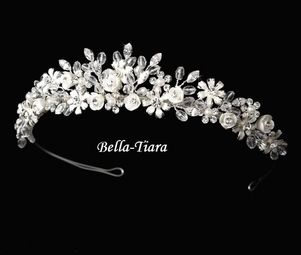 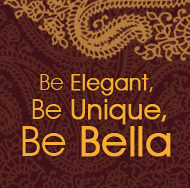 HOME / WEDDING HEADPIECES / Wedding Tiara / Jemma-Romantic ivory crystal bridal tiara - SALE!! 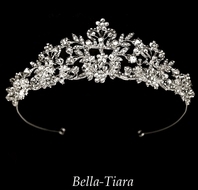 Description: Classic and elegant, this silver plated tiara features a bridal bouquet of ivory porcelain flowers, freshwater pearls, silver flower details, rhinestones, and a spray of clear swarovski crystals. 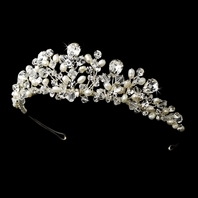 A beautiful accessory to your ivory or white wedding dress. 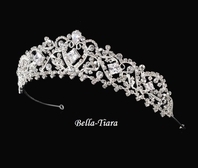 The ornamented portion of the piece measures 8-3/4" wide and 1" tall, and the piece ends with two loops that allow you to fasten it in your hair with bobby pins. 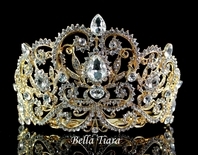 Size: 8-3/4" wide and 1" tall.